We are continuing our study in the Gospel of Matthew. We started with verse one and now we will continue in verse one, and hopefully get a little further in to the chapter. 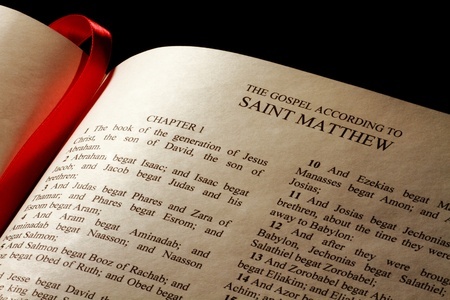 Saint Matthew says Jesus is “the son of David, the son of Abraham.” Didn't Matthew know Abraham came before David? Of course he did because he makes that clear in the rest of the genealogy. Then why did he put it this way? He is presenting the Lord Jesus as the Messiah, the One who is the King, the one who is to establish the kingdom of heaven on earth. And that comes first. He must be in the line of David in fulfillment of the prophecies that God made to David. He is the son of David. He is also the son of Abraham and it is very important that He be the Son of Abraham, because God had said to Abraham, “...And in thy seed shall all the nations of the earth be blessed...” (Genesis 22:18) And in Galatians 2:16 Saint Paul explains that who that “seed” is: “To Abraham were the promises made and to his seed. He saith not, And to his seeds, as of many: but as of one, And to thy seed, which is Christ.” So Jesus Christ is the Son of Abraham. “Abraham begot Isaac. And Isaac begot Jacob. And Jacob begot Judas and his brethren. And Judas begot Phares and Zara of Thamar. And Phares begot Esrom. And Esrom begot Aram. And Jesse begot David the king. And David the king begot Solomon, of her that had been the wife of Urias." A careful look at the genealogy that follows is very interesting. Four names stand out as if they were in neon lights. It is startling to find them included in the genealogy of Christ. First, they are names of women; second, they are the names of Gentiles. Customarily, the names of women did not appear in Hebrew genealogies, but don't find fault with that for the very simple reason that today we have the same thing in marriage. In a marriage the name the couple takes is the name of the man. Although legally it can be done the other way around. But the custom here in the states is that they don't take the name of the woman. Her line ends; and that's the way they did it then. “Thamar” is the first one, and she is mentioned in verse three. Her story is in Genesis 38, and there she is called Tamar. That chapter is one of the worst in the Bible. Thamar got into the genealogy because she was a sinner. “Rachab” is the next one, mentioned in verse five. She's not a very pretty character in her story back in Joshua chapter 2 where she is called Rahab. But she did become a wonderful person after she came to a knowledge of the living and true God. She got into the genealogy of Christ for the simple reason she believed. She had faith. Notice the progression here. Come as a sinner, and then reach out the hand of faith. “Ruth” is the next one mentioned in verse five. She is a lovely person, and you won't find anything wrong with her. But at Ruth's time there was a Law which shut her out because it said that a Moabite or an Ammonite shall not enter into the church of the Lord. Although the Law kept her out, there was a man by the name of Boaz who came into his field one day and saw her. It was love at first sight! That's right! He loved her at first sight, and he extended grace to her by bringing her, a Gentile, into the congregation of Israel. She asked, “...Why have I found grace in thine eyes?” (Ruth 2:10) You and I can ask that same question of god regarding His grace to us. Again, note the progression. We come as sinners and hold out the hand of faith, and He, by His marvelous grace, saves us. "Bathsheba" is not mentioned by name but called in verse 6 "of her that had been the wife of Urias." She got into the genealogy of Christ because God does not just half hazardly and flipantly throw away one of His children who sins. A sheep can get out of the fold and become a lost sheep, but we have a Shepherd who goes after that sheep and is always trying to bring them back into the fold. So this is the whole story in a nut shell of salvation right here in this genealogy. Now there are some more interesting things about this genealogy. If you will compare this genealogy with the one in I Chronicles 3 you will find that in verse eight of Matthew, the names of Ahaaiah, Joash, and Amaziah ar left out. This shows that genealogies ar quoted to give us a view of a certain line of descendants and that every individual is not necessarily named in every genealogy of the Bible. . These are not necessarily complete genealogies, but they are given to trace a certain line for us.